It rained tonight. Pretty much. 6.30 I feel it's time to get up. It is cold. A gray sky, where clouds partially hide some of the surrounding mountains. Not encouraging. It takes time to get started, also because there always are people to talk to and share experiences with. The toilet facilities here are somewhat limited, even they have water closets. But there is a nice kitchen building built in a kind of ancient-style. You can not help getting along because there are only 2 gas rings. As I leave at 10am it has just started raining. Hmm. Back on the main road, it starts with a trip across a mountain ridge. The road winds in great twists. It rains - sometimes more than others. As a rule, you can see 3-4 km until the next turn. If the road now turns left the wind comes more from the side or if it turns right it's head wind - these are the big and important issues as a cycling tourist. The wind is not COMPLETELY as hard as yesterday. But it's cold. Even colder than yesterday. Occasionally my fingers are numb. Take breaks in between, where I only stand by the bike for a couple of minutes. It helps. The new roll of biscuits tastes excellent. 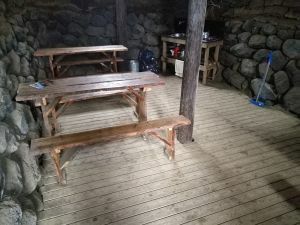 There will be a inhabited spot with camping in about 26 km. Since there's nothing to give shelter, not to mention to lean the bike upon, it's all I can look forward to. The rain has been stopped. I discovered it only when it started again, now it's raining a lot. I decided to drop Dettifoss, it was another of the main points in the plan. But who bother driving 35 km on a bad road in a head wind to watch a waterfall in the rain? Though it is Iceland's most watery. So the plan is to go directly to Myvatn. I'm looking out long for the break spot. I'm watching a bigger dark lump. Can it be trees? I am so focused that I don't see the bridge until late. A suspension bridge of 100 m. It must be the Dettifoss river that runs here. The fall is unfortunately 35 km away. Here is also Grimstunga, as it is obviously called. But it's 4 km down the road. Do I want to go so far on gravel for a cup of coffee? I decide to make the attempt. It is also the road to Dettifoss, so I can get an impression of the road and the wind. First I sit out in the cold and eat my lunch - I'm allowed to. Then there is coffee and cake for 1200 kr. ca. 70 d.kr. It's wonderful to get into the heat and although the strawberry cake is more or less frozen still and the coffee is extremely usual, it's worth all the money. And then there's Wi-Fi !!! I asked the lady how that was possible? It's cable, it turned out. There is also TV. And phone. It must be some real long cables they have added to the north. Then it's out in the cold again. 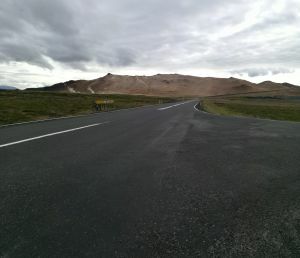 The 40 km to Myvatn. The first harassmentist has now passed. Runs consciously as close as he dares at high speed. I consciously write HE.The road winds in large slopes through the landscape, sometimes up some down. There have been sheep again. It can be too small for everyone. The wind is better so I'm moving forward. In addition, it has stopped raining and somewhere far ahead, one can see the sun shine. I am counting down. Now there's only half left. Civilization is popping up. Something that is undoubtedly a mobile mast and a measurement station, I think. And there are some power lines from somewhere down to the south. Probably heading the same spot as I. When there is only 10 km left, I start to look ahead. I don't know what I'm looking for, but Myvatn is at least a lake. There are some mountains that look as if the sun is shining on them. They are quite bright and there IS sun in that direction. Eventually there are mountains all the way in front of me. There's smoke in front of them at a certain spot. And I can smell sulfur. After a while the smell is gone. Then I see the way. It winds up the bright mountain and disappears. That must be the way I'm heading. And now I realize that one obviously have to get up into the crater to get to a crater lake. And a moment later, the whole scene to the left of the road in front of the ascent is in front of me. A more or less yellow-colored area with one smoking point next to the other. And a parking lot and a lot of people, who doesn't look that many in the big area. 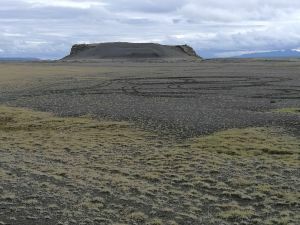 It is "Namafjall" or "Hverir". I park the bike and walk around the sulphur smelling with the others. Bubbling puddles and howling let out of gases. As I drive back, I do not know which country I'm in. I don't know why, maybe it's a part of the feeling I often get when I'm away for long. It turns into the "country" I travel, and which I acuire as I get to know it. 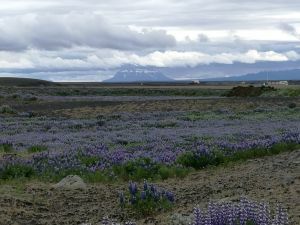 I am surprised when it comes to me that it is Iceland. There is a sign that threatens 10% the next 4.5 km. Then you know what the next half hour will be spent on! I take one break, then it seems I'm up. Already? That is actually the case. Now I just have to go down on the other side. Just as the descent starts, there is a parking lot. 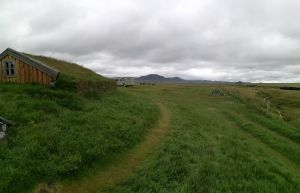 I go there and take a close look at Myvatn and the surroundings. It is very strange. It's like a Tolkien universe. The smoke comes out of the earth all around. Then I hammer down and finally reach a sign: Reykjahlið. That's what the town is called. I have never heard any mention the place like that. It's always Myvatn, both the lake and the town. There is also a sign with Myvatn S.
The campsite I have heard of is located just down to the lake, but you must not walk the last 5 m, it is a "restricted area". I payfor 2 days, can always extend. 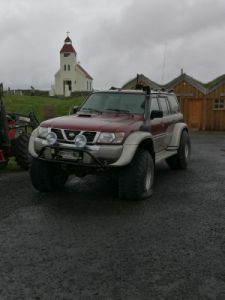 The idea is to sightsee tomorrow on my own and book a tour to Askja the day after tomorrow. It's an 11 hour trip in a 4WD bus for 23,000 is. kr. It's expensive, but I probably might not get here again ever. I arrived at 19.30. Now it's 21.30 and I've pitched my tent and eaten and written and had tea, so now I'm ready for an "early night", except that the sun, which was shining even before I came, is quite high in the sky. It's probably hot in the tent. Strange - when you think of how cold it has been today.